Hoping to entertain you with my cooking adventures one post at a time. I decided to make potato skins today - I made them at 7:30 pm for Iftar and I am now typing the recipe at 1:49 am in the morning. This is probably the first time I have typed out a recipe this quickly but I did not anticipate the amount of requests I would get for this recipe. Of course, the fact that I shared it on my own Facebook page, on other Facebook forums, Instagram & Twitter might have contributed to the amount of likes & "recipe please's" I got. But basically long story short, I am staying up tonight so I can finish this recipe in time for you to make it at Iftar tomorrow! Peri Mayo Dip - Mix together 4 tablespoon mayonnaise, 1 tablespoon Peri Peri sauce, 1/2 teaspoon salt, 1/2 teaspoon red chilli flakes. Other Filling Suggestions: Sliced Jalapeno's, Sliced chicken sausages, Sauteed Peppers (Green, Red or Yellow), Pepperoni. Other Garnish Options: Sour Cream, Sliced Green Onions, Caramelized Onions, BBQ sauce. Preheat oven to 180 degrees centigrade. Prick potatoes with a fork all around. Place the potatoes on a baking sheet lined with aluminium foil. Brush the potatoes with olive oil, salt & black pepper. Bake for about 45 minutes - 1 hour till cooked through. Once you can easily pass a knife through the potatoes, they are done. Take the potatoes out of the oven, cut them in half and then set aside to cool. Take grilled chicken (sliced in chunks) & combine with sweet corn and green olives. Season with salt (1 tsp) & white pepper (1 tsp) and mix it altogether. Set aside. Take the potatoes & scoop out the insides leaving about 1/4 inch layer of potato. Make sure you do this very carefully because if you remove too much, they won't stand up on their own. However, if you don't take out enough flesh, then there won't be enough space for the topping. The leftover potato flesh can be used to make mashed potatoes. Stuff the potato skins with some of the chicken + corn mixture, then the shredded cheese. Top with just a little bit of the chicken + corn mixture so that it looks good. Turn the oven to 200 degrees and bake for about 10 minutes till the cheese is melted and the skins are crispy. Top with Peri Mayo dip. Marinate 400 grams boneless chicken with 1 tablespoon oil, 1 teaspoon vinegar, 1 teaspoon salt, 1 teaspoon white pepper, 1 teaspoon garlic paste, 2 tablespoon Peri Peri sauce, 1 teaspoon paprika, 1 teaspoon red chilli pepper & 1 teaspoon red chilli flakes. Leave to marinate for 30 minutes. Using a pastry brush, brush about 1 tablespoon of oil on a grill pan, and add chicken. Grill for about 10-15 minutes on each side, till the chicken is cooked & the water dries. Slice chicken into small chunks. 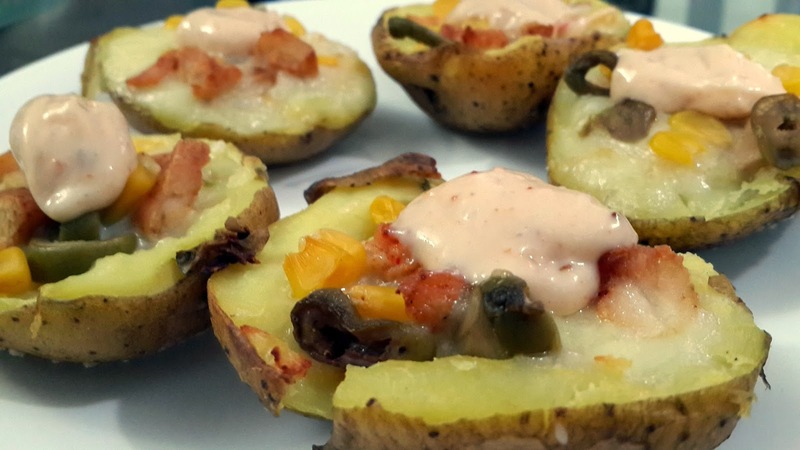 Use about 1/2 cup of cooked chicken for the potato skins and reserve the rest to use in some other recipe (pasta, sandwiches, etc).